Molly Mansker from the Poulsbo Chapter of Days for Girls spoke to our club about the organization's activities. Their motto is: Every girl. Everywhere. Period. Days for Girls International is a grassroots 501(c)3 non-profit. Women, and girls discover their potential and self-value, are equal participants and agents of social change and are given opportunities to thrive, grow and contribute to their community's betterment while ensuring quality sustainable feminine hygiene. Rotary International is one of a number of "Impact Partners" for Days for Girls, which has numerous community projects in countries world wide. 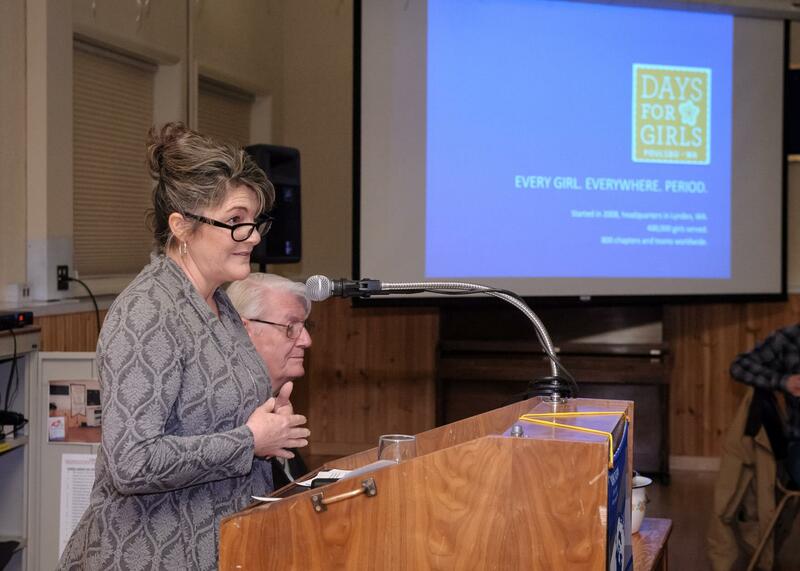 Poulsbo Rotary has contributed to a Days for Girls project in Kenya. Molly explained that many girls there miss 5 days of school per month because of feminine hygiene issues, and that humanity can’t afford this. Fundraising and organizational support for Days for Girls pays for feminine hygiene kits that are distributed to young women in the communities served. For 8 years, women have been sewing washable sustainable feminine hygiene pads that last 3-5 years. Making the kits is very labor intensive, with each taking 3-4 hours to complete. However, for the girls who receive them, they bring freedom.